With the arrival of summer comes our annual pilgrimage to Montana. It’s a moment we all look forward to, when we leave the crowded flatness of Chicago and head for the open space of the mountains. The drive to Montana is usually scenic but not exciting. Except, that is, last year. Last year we decided to do something different. Note to self: past experience shows doing something different is bad. Apparently, I’m a slow learner. 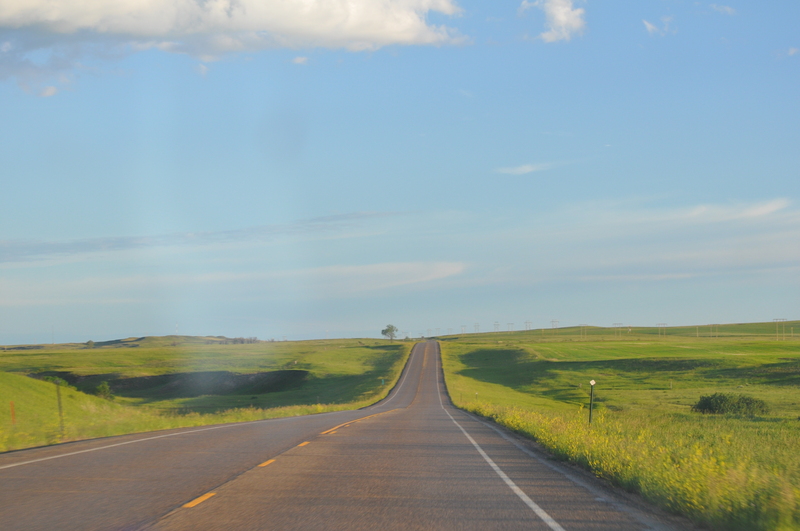 We usually take Interstate 94 across North Dakota, which then drops down to join Interstate 90. Montanan friends of ours, however, said we should take Route 200 from the North Dakota border. It’s a smaller road, but it goes straight across, saving a lot of mileage. We looked at the map, did some calculations and figured that 200 would save us some time – but not much. However, it promised to be scenic. And what the heck, it seemed like an adventure. And so, we roused ourselves at 3:30 AM from our hotel in Dickinson, ND, (we like to leave in the early morning – a.k.a. the middle of the night – to get a jump on the driving for the day) and hit the road. We sped along through the thin pre-dawn light. 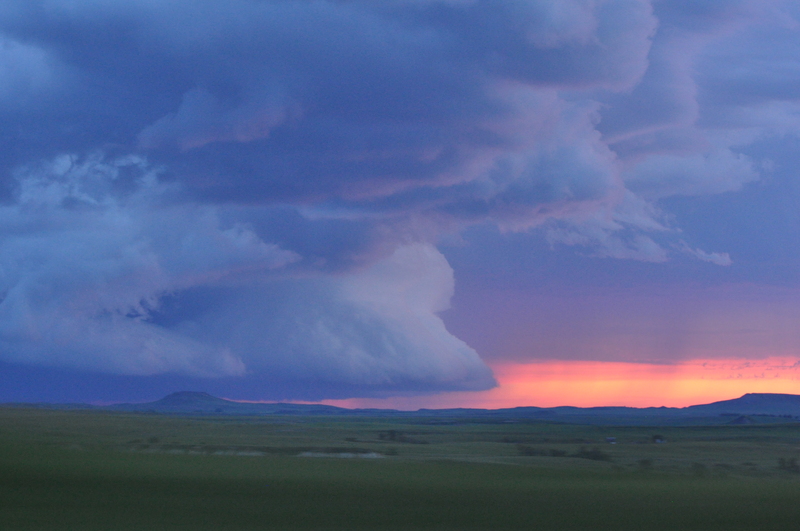 We passed through a few storm clouds just as the sun came up, but then found clear weather after that. 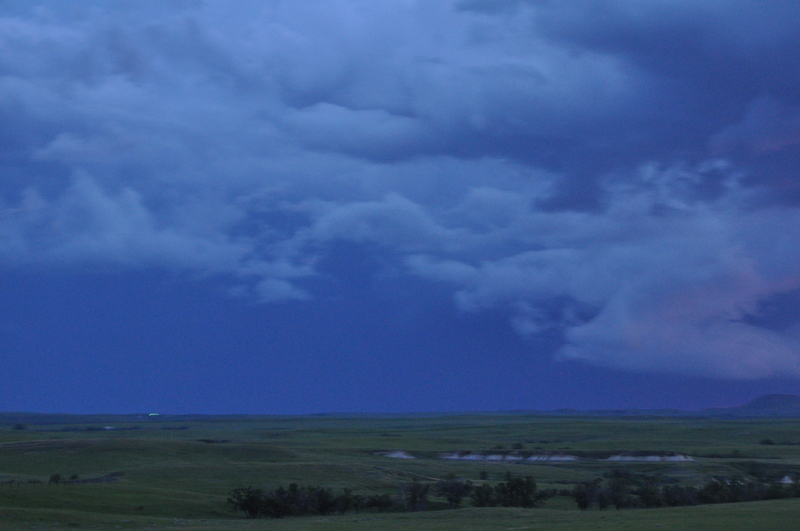 It was just getting light as we passed through (I kid you not) Home on the Range, North Dakota, and we came through Glendive soon after. We did one last “Are we sure we want to do this?” check, and got off the highway. Sure enough, it was scenic. 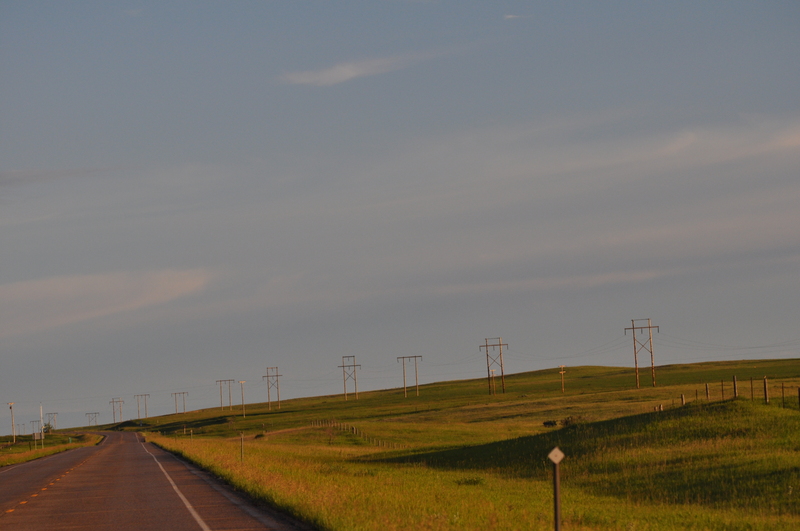 Route 200 through Eastern Montana consists of just one lane each direction, but it’s a straight shot through wide open country. 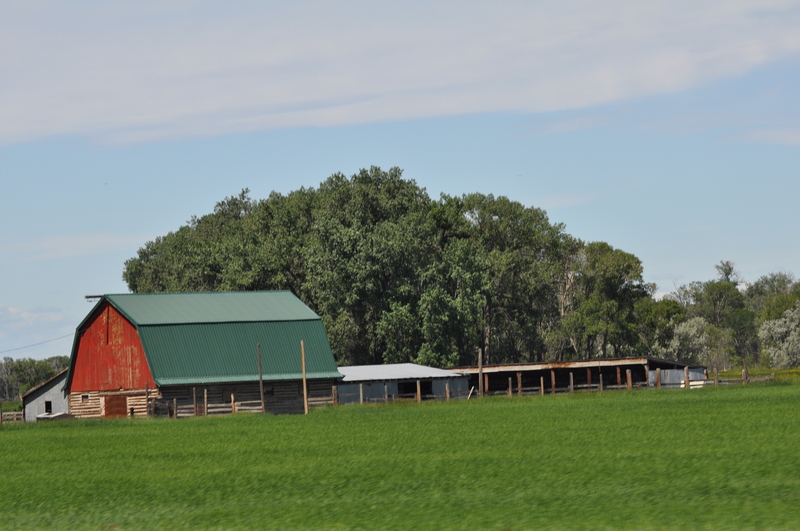 We cruised along at 65 miles per hour, admiring the views. Some wildlife, a rare smattering of buildings, but for the most part just empty land as far as the eye could see. Less than an hour later, we got to our first town, Circle. That’s when we realized that we might be in trouble. Circle, cute town that it was, was closed up tight. We’d forgotten that not everyone would be up at 5 a.m., particularly on a Sunday. We were getting low on gas and completely out of coffee. The gas station was closed. Everything was closed. OK, coffee we could live without, but gas? Now, we’re not idiots. We know better than to drive around the open West on an empty tank. When in the Dakotas or Montana, our policy is to never get below a half-tank. But that assumes there are open gas stations to refuel at. And in Circle, Montana, there was not. We kept on going, hoping for butter luck at the next town, Jordan. We examined the map. Only an hour to Jordan. But what if they don’t have an open gas station, either? After that, the next town was Lewistown, a large (by Montana standards) city that would surely have a station open by the time we got there. The question was, could we make it? We debated what to do. Should we head back to the highway? But that would add a lot of time and there was no guarantee that there’d be a gas station when we got there. 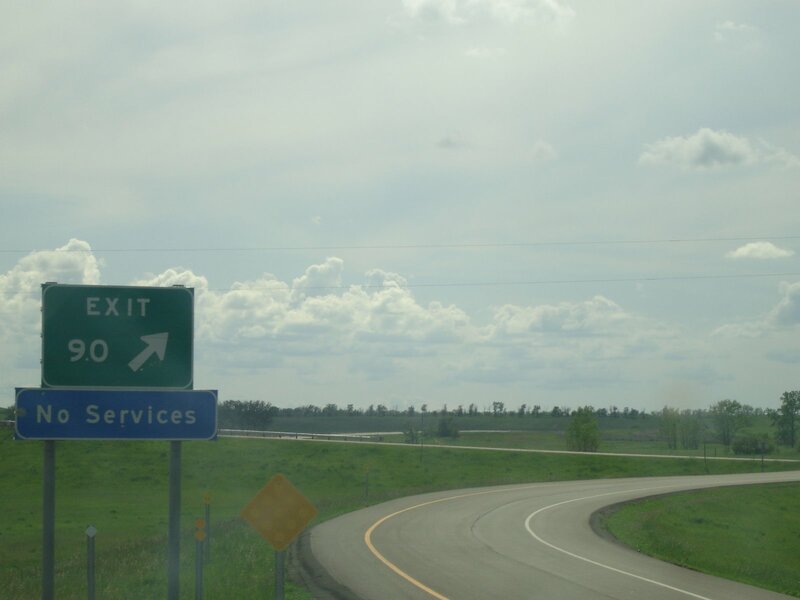 Eastern Montana is famous for its “No Services This Exit” signs on the highway, which means that, quite literally, you’d get off the exit ramp and find precisely nothing. Not even a dirty, overpriced service station with bad coffee and worse bathrooms. We decided to press on to Jordan and hope for the best. Fortunately, we were in Montana, where people help each other. Still, I didn’t relish the idea of knocking on a rancher’s door just after dawn on a Sunday morning, sheepishly saying, “Hi, so sorry to bother, but do you have a gas tank on your property and if so can we buy a few gallons off you?” As we cruised along, I kept an eye out for homesteads where we might be able to stop in a pinch. I pulled out my phone to google “Gas Station Jordan Montana.” I was even willing to try to get information the old-fashioned way, by calling 411. But alas, no service. Not even one teeny, tiny bar. We drove along, through open grassland, up and over hills, with no one and nothing in sight. Our gas was gauge dipping lower and lower. We realized that Jordan was our only hope. There was no way we could make it to Lewistown. It had to be Jordan, even if they only had one station and even if it wasn’t open. “Well, how are we going to do that?” my husband asked. “It’s Montana. We’ll find someone to open it for us,” I said optimistically, although actually I had visions of us parked in front of a small and quite firmly closed gas station, waiting for the attendant to show up…on Monday morning. I took mental note of how many granola bars we had left and wondered if they could feed the whole family as we camped in our car outside the local Cenex station for 24 hours. We nervously pulled into Jordan, a speck of a town, and proceeded down the main street. I saw what appeared to be a gas station ahead on the right. And a small sign glowing “Open.” Hallelujah. 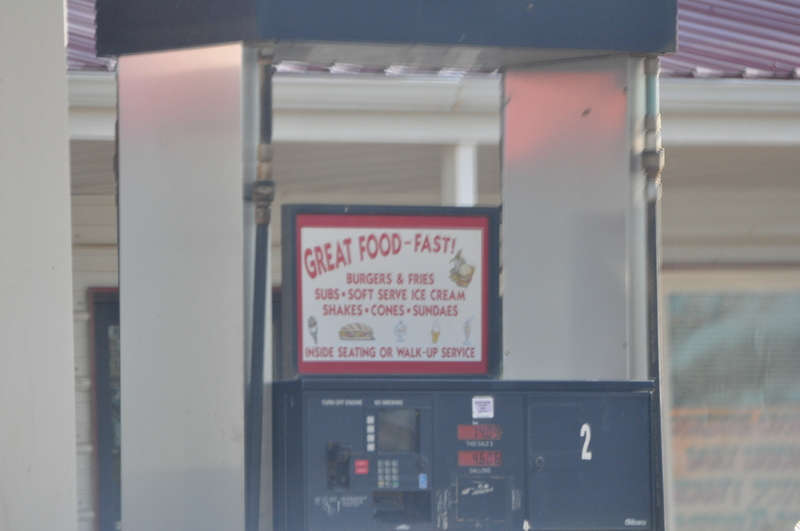 Not only was the gas station open, but the general store and the restaurant were open too. As a nice bonus, they all happened to be one entity. We walked into the gas station/store/restaurant relieved and grinning like idiots. The restaurant, it turned out, was packed. Crusty ranchers, sprawled at tables much too small for them, turned to stare at us as we walk in. I felt a little conspicuous clad in yoga pants and wearing socks with sandals (don’t judge: fashion rules don’t apply on overnight road trips). The smell of coffee and bacon hung in the air. It was one of the most heavenly scents I’ve ever encountered. I smiled and said good morning to what appeared to be the vast majority of the population of Jordan and asked the waitress/store clerk/station attendant if we could get some coffee to go. I was tempted to stay and pull up a chair and hear some stories from the Jordan locals, but we now had coffee, fuel and a place to get to: home. Thank you, Jordan, for your gas station. We’ll never forget you. This year, we’re sticking to the highway, but if we ever take Route 200 again, I’m sure we’ll be back. And maybe next time we’ll stay for the bacon. Ryne, I knew I could trust you to have your priorities in order. Bacon, then gas! Wait, that doesn’t sound right…. a couple of rules in life…. always stop at lemonade stands, and NEVER leave a restaurant that smells like bacon! It was a welcome surprise to see you last night. stop in on your way back west…this time, I’ll pick you up at the airport. and one more rule.. stay clear of the bears! Love, Mary O. A friend and I, driving in separate vehicles, drove across 200 on our way to Glacier Natl Park last summer (me from Georgia, he from Michigan). 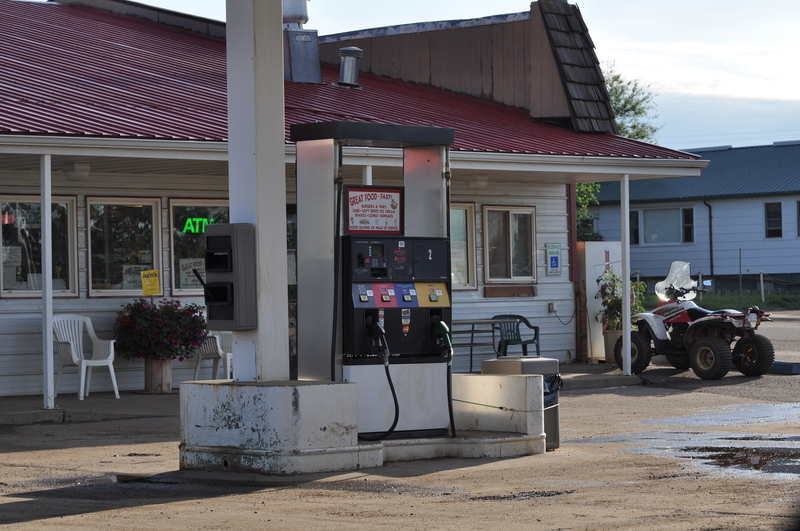 We ended up standing in the parking lot of a “rest area” at the corner of M-200 and M-24…ALSO on a Sunday morning…trying to decide if we had enough gas and food to get us to Great Falls, or if we should head north and try our luck on US-2. 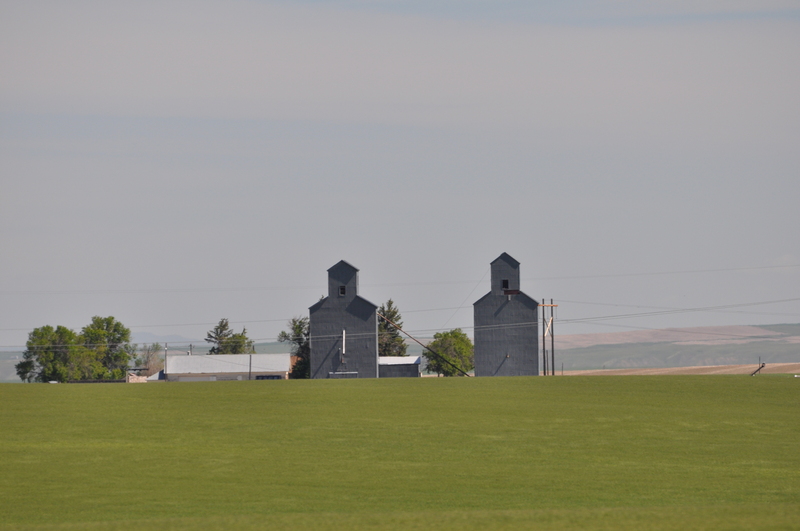 Same dilemma…we didn’t know what to expect from small Montana towns on a Sunday. We rolled the dice and (as you did) hoped the little spot on our map called Jordan would have gas and food for us. We stopped at the same gas station/cafe that you did. It was around noon and we had been driving since 3am and were tired and hungry, so we tried out the cafe. It had the looks of a softball field concession stand so I had low expectations…until I got a really tasty pastrami sandwich the size of my head for about four bucks! It was great. Great little town in the middle of vast expanses of and very nice people. Just remember not to speed through town…the local constable was giving tickets to out-of-towners the whole time we were there.